The green tips with a hint of blue of x Chionoscilla allenii ‘Sibbertoft Form’ are just beginning to show through the ground in a raised bed in our cold, damp Ulster garden now in the first few days of March. 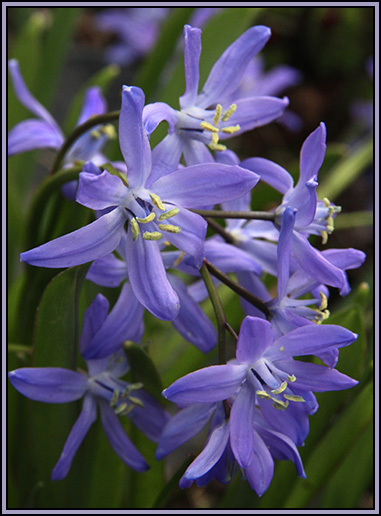 X Chionoscilla allenii is a naturally occurring hybrid between Chionodoxa siehei and Scilla bifolia, found by James Allen in his garden in Shepton Mallet, and ‘Sibbertoft Form’ is a cultivar. 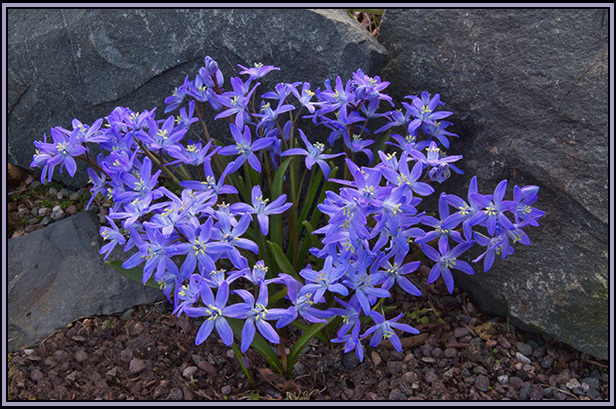 This hardy little bulb produces a great display of violet-blue starry flowers, approximately 8 – 10 cm high, rather like a chionodoxa flower, in early spring. I was given these bulbs along with Corydalis malkensis several years ago by Rod Leeds, having admired them growing profusely in his garden in Suffolk. These original x Chionoscilla allenii ‘Sibbertoft Form’ may, I think, have come from the garden of the late Richard Nutt, a galanthophile and contributor to the AGS Bulletins in the sixties. Both plants have survived here – the blue and white making an attractive combination and requiring very little care and attention. I am surprised that this bulb is not more readily available as it has so many good qualities – pretty flowers, neat small size, increases at a gentle pace, hardy and suitable for troughs, raised beds or the open garden. It is also a plant which, like so many others, brings back happy memories of both people and gardens visited in the past.